Gennifer Choldenko is the author of Al Capone Does My Shirts, which features my least favorite character ever in an otherwise good book. I'm happy to report there is nobody truly vile in Chasing Secrets. Lizzie loves science and wants to be a doctor, which makes her an anomaly in San Francisco in the 1900s. She thinks she knows it all, but when rumors of the plague begin to spread, Lizzie realizes that she isn't quite as informed as she'd like. She and some new friends set out to uncover the secrets that the adults in power would like to keep hidden. There is so much to unpack in this novel; it would make an excellent literature circle selection for 6th or 7th graders. There is a lot to discuss about race relations and feminism in the novel, but I was most interested in the issues of medical care in Chasing Secrets. Is it ethical to hide medical information that could incite panic? Who deserves the best medical care and why? Although this is historical fiction, there are so many links to today. I haven't seen this topic covered in a middle grade novel before and I can imagine it would lead to great classroom debates. This is excellent historical fiction with mystery mixed in to appeal to a variety of readers. 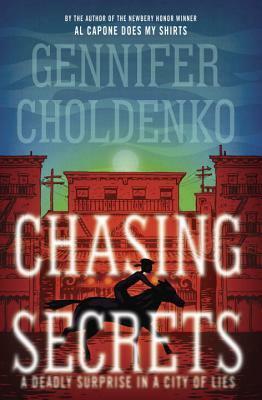 I'm glad I got over my old prejudice against Choldenko's characters and tried out Chasing Secrets.